Tennis… The Red Devil tennis team will be hosting eh Broome Centurions today at 5:00 pm at the courts on the campus of CMS… Go Big Red! Volleyball… The Raider volleyball teams hosted the Westside Rams in region action yesterday at the LDHS gym. V: Westside 3 – Laurens 2… In varsity action, Westside took a hard fought 3-2 win over the Raiders… Laurens won the first set 25-15 but the Rams came back and took the next two sets by scores of 25-17 and 25-15… The Raiders fought back to take the fourth set by a score of 25-19… In the fifth and deciding set the rams took a 15-12 win to claim the match win… Foe comments from Coach Fleming click here. JV: Westside 2 – Laurens 0… In JV action the Rams took a 2-0 win… set scores were 25-15 and 25-17… Again for comments from Coach Fleming click here… The Raider volleyball teams will be back in action tomorrow when they host the Woodmont Wildcats. 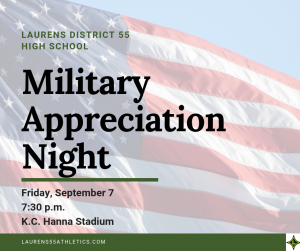 Military Appreciation Night at K.C. Hanna Stadium… This Friday night the Raider football team will be honoring veterans and active duty military as they host the Hillcrest Rams… They will recognize this special group in pregame ceremonies and as part of this veterans and active duty military can get in to the game free with proper ID… For more information and specifics on this, click here.… Also a reminder that you can avoid the lines at the ticket booth for all Raider sporting events by purchasing your tickets online… In order to do that click here or go to https://laurens55athletics.com, select “MORE” from the menu options at the top of the page and buy tickets in advance. Laurens Academy… The Crusader volleyball teams hosted the Eagles of Richard Winn Academy in region action. V: LA 3 – RWA 1… In varsity action the Eagles took the first set by a score of 25-18… However the Crusaders fought back and won the next three sets by scores of 25-13, 25-22 and 25-16 to take the match 3-1… The win allowed the Crusaders to remain in first place in the region. MS: LA 2 – RWA 0… The news is just as good where the middle school team is concerned as they took a 2-0 win over the Eagles… Not sure what the set scores were but they remain undefeated in region play… The Crusaders will travel to Anderson Montessori for matches’ tomorrow. Red Sox 5 – Braves 1… The Boston Red Sox made it two in-a-row over the Braves in Atlanta last night as they took a 5-1 win… The Red Sox simply outhit the Braves 8-4 and the Braves only run came on a Kurt Suzuki homerun (10) in the second inning… The two teams will close out the series this afternoon as the Braves have to get away early to board a plane and start a road trip out west tomorrow.